It's spring and I'm in the midst of spring cleaning that's long overdue. After years of a lick and a promise (translation: a little bit of work and a promise to do better later), we're doing a massive cleanup of the garage. We've lived in this house since 1980. That's a lot of years to accumulate a lot of stuff and since we don't have a basement, the garage bears the brunt of the storage. So, we're working like busy bees...and fighting off the busy hornets or wasps that seem to have a home somewhere near the garage. I think today we finally made some progress, spraying nasty chemicals in every nook and cranny that looked like a little home for the nasty little creatures. This will make this job a lot easier since, hopefully, I won't be running for cover every time something flies by my head. Sigh. I keep telling myself how happy I will be when this job is completed. We cleaned out the spare room over the weekend. The bunk beds have been taken down and stored. The only piece of furniture I'll be leaving in there is the desk. I plan to use that. The next step is to get the floor refinished. I'm working on a few things. 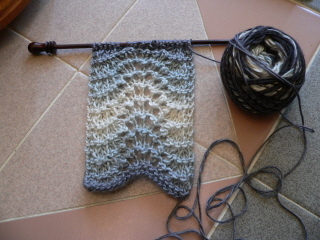 This sock is almost done. I love this yarn. It's Austermann Step, with aloe vera and jojoba oil. The oils will last through 20 washings, or so I'm told. It's really nice to knit with. The picture lies about the colors, however, due to the flash. It's really dark green, light green and that orangy color is really a pretty light brown. These colors are pretty close, the ever present purples with some blue and brown. 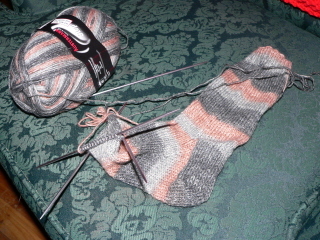 This is Koigu and this sock is just past the heel. Working simultaneously on two different socks is my lame attempt to keep second sock syndrome at bay. 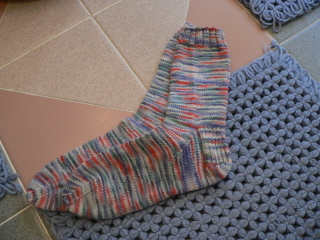 When I get tired of working on one sock, I can just work on the other one for awhile. The downside, of course, is that it takes me twice as long to get two pairs of socks. I get them done eventually, though. 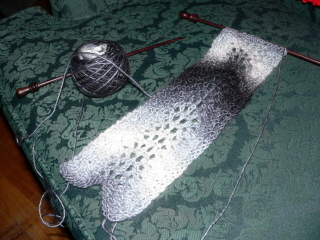 Also, I'm still working on two scarves. The flash made the white part of this scarf really bright. In real life, it's a softer color, not so harsh. I haven't worked on this in a few days but when I do, it makes me smile. Here's my silk garden scarf. These colors are close to real life, purple moving into black and gray. This is my mindless, easy knitting scarf that I can work on when Lorelai's here. I don't like to work on socks when she's playing on the floor because if she decides to climb up to see what I'm doing, I'm afraid I'll hurt her with the four sharp, pointy dpns. These short straight needles are a lot safer. I finally got myself outside to trim the rose bushes last week. My friend, Sonia, who took my sign language class at BOCES, taught me how to prune them correctly. 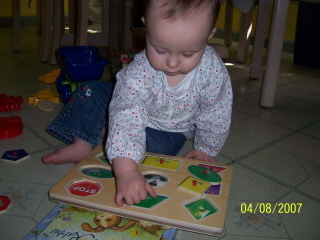 It's amazing how much sense it makes when someone shows you rather than trying to decipher the directions in the books. There's still some weeding and cleanup necessary before the summer but I'm happy that job is completed. It was warm today, in the 70's. The rest of the week is supposed to be cooler, which is nice. I always appreciate an actual spring instead of jumping from cold weather to summer heat. Tigger says don't work too hard...chase butterflies! Now, where was I? Right here trying to remember everything I haven't written about this month. First up, Easter. Easter was a quiet day here. I made stuffed peppers (which is technically pasta, sauce and meatballs with the extra added attraction of peppers stuffed with the beef mixture - recipe here), a family favorite, and we just relaxed. Well, relaxed as much as we could with two important sports events unfolding on the two TV sets in the house. Dad was in the living room watching the last day of the Masters golf tournament and Billy was in Kim's room watching the Islanders try to get into the playoffs. The Masters was won by an up and coming golfer and yes, the Islanders made it into the playoffs. At the end of the game, Lorelai was asleep inside so Billy had to quietly celebrate as he literally jumped up and down. Some things never change. Lorelai enjoyed her second Easter Sunday. 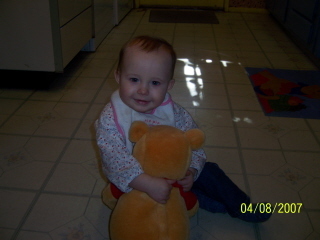 She loves playing with her friend, Pooh. 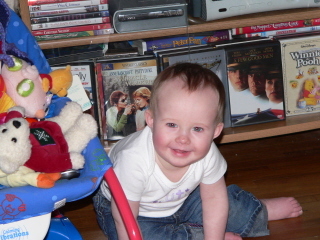 She hugs and kisses him now and knows exactly where to find him in Nana's room. I like to get educational toys. Let's see, what else? Well, last Saturday afternoon, I met my new knitting friend, Mardi, in Manhattan. We spent the afternoon exploring downtown yarn shops we didn't have time to visit when we were in town for the book launch. We started at Seaport Yarn. This place is overwhelming! It's beautiful. They have rooms stuffed with all kinds of yarns and "toys" (needles and such). 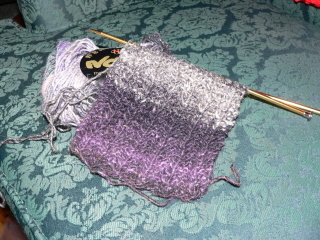 I bought some yarn for a scarf here, Noro Silk Garden, and an Elizabeth Zimmermann book, Knitting Around. We moved on to Purl on Sullivan Street in Soho. I'm trying to remember what I found here. I believe it was the amazing Alchemy migration yarn. I don't see the yarn I bought here on the site. It's a silk/wool blend. More on that later. By this time, we were ready for a break so we went to Knit New York. While this shop didn't seem to have the selection of yarns the other shops did, Knit New York does have a cafe. It's a lovely little place and Mardi and I had a cup of tea and a little snack. I did buy some yarn here, some Zara merino in pink and purple for a Lorelai hat for next winter. Our last stop was a little shop called Downtown Yarns. I found some black and gray Lang Tosca, also for a scarf. Somewhere along the line, I also bought some sock yarn (although I promised myself I wouldn't), Schaefer Anne and some Cascade yarn in a very pretty green, destined to become a hat. Assorted other little things followed me home as well, like rosewood needles. I had finished my "traveling" socks the day before this expedition and wore them that day. When you're trekking around NYC all afternoon, thank goodness for sturdy walking shoes and comfortable, hand knit socks. 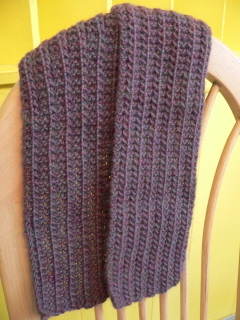 Yesterday, I finished the purple scarf I'd been working on. Same harlot pattern I love. 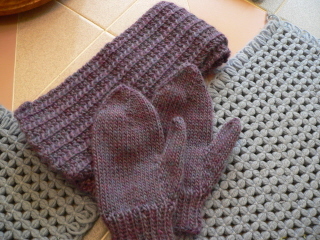 I had yarn left over so I made a pair of mittens between yesterday and this morning. Lastly, here's a work in progress. 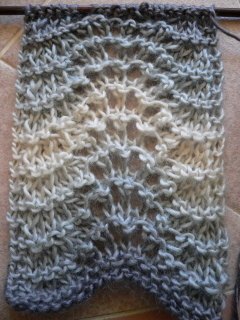 My first attempt at knitted lace. Here is the Alchemy migration silk/wool blend yarn in a color called nighthawk. The pattern is feather and fan. This will be a scarf (4" by 45"). I can't tell you how pleased I am by this little thing. I've been very intimidated by lace. This is a good beginner pattern. That's all for now. I'm hungry, people. I'm going to find lunch! Pooh says, where's the hunny?? Pooh and Piglet say....have a very happy Easter day. 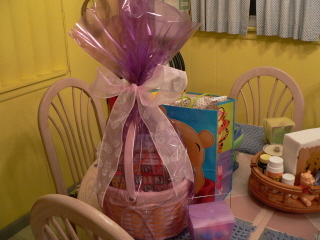 Easter gifts, ready to go. Kelly, Kim and Billy will get the little plastic "Chinese food containers". I found them at the craft store. Aren't they neat? Perfect for a gift card. The basket, gift bag and toy behind it? For Lorelai, of course. Me? Go overboard? Whatever made you say that? A better look at Lorelai's basket. May the bunny be good to you! Jan, Lori and I took in A Chorus Line last night. I never saw the first production, although it was at the Shubert Theatre for how many years? I think 15? It opened the summer we got married and at that time, Times Square and the theatre district was a more dangerous place. I would have loved to see shows but I was afraid to go. So, I'm probably one of the few theatre fans who didn't see the original play and was anxious to finally see it. Jan got great seats! It's a terrific show. It was great seeing these characters evolve and I now understand why true theatre fans hate the movie. As I was reading the Playbill on the way home, I was fascinated with one small article about the show. It lists the shows the cast has performed in collectively, along with the years they studied dance and the number of teachers they had, how much is spent on dance lessons in one week and other facts of that sort. Really makes you think how dedicated these people are and the show made me think how each performer is telling their own story, even if the personal story is different. Yeah, I know. I'm 30 years too late to this show, right? I'm still undecided about what to make for Easter dinner. I'm actually thinking of stuffed peppers! Not really an Easter dish but we like it. I don't know. I have to make a decision before I go food shopping today, obviously. Bouncing around and back to theatre, Young Frankenstein is coming to Broadway and word is that Douglas auditioned for the lead (Gene Wilder part). Now, I may be biased but I don't think there's anyone who could do that part any better than he would. He'd be great. I think the rest of the cast is in place and rehearsals have to start soon so we should find out soon who it will be. 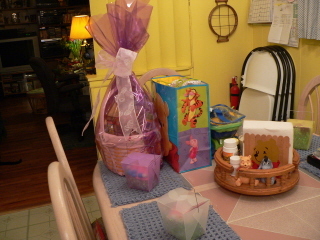 Along with the food, I need to get a few things for baskets and such. I'd better get a move on. I'm so lazy today. Tigger says bring on those Easter eggs! Interesting. It does look like rain. In fact, it's raining out there at the moment and the wind's howling. It would be appropriately springy if not for the fact that it's also 41 degrees. Downright chilly. So, it's April. I have a good excuse for getting a late start on this month. I spent Monday on the couch with another stomach virus. I'll spare you the gory details. You'll thank me. Yeah, that was quite an April fool joke. I'm feeling much better, although food still doesn't interest me much. I'm getting hungry and I feel fine after I eat, I just don't feel like eating. Of course, this might jumpstart the desire to lose a few pounds. Hey, whatever works, right? Billy's new apartment is really nice. I should take some pictures. Of course, what's the first thing a man buys for his castle? A new TV. Bill and I went over on Saturday (I think it was Saturday) and helped him mount it on the wall. I was very nervous about this. I kept whining and saying it would really look nice on a stand. But we got it up there and it looks nice. Since I've been on the couch for a couple of days, I was knitting. Take a look at this. it looks a lot better when you wear it. I made these because I thought they were so cute. I'm not sure when I'll actually wear them, though. 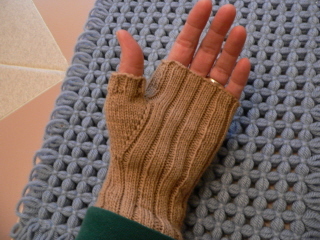 I suppose they'd be handy for interpreting outdoors in cooler weather, especially since they're sort of flesh colored. I tried and I can easily fingerspell with them on. 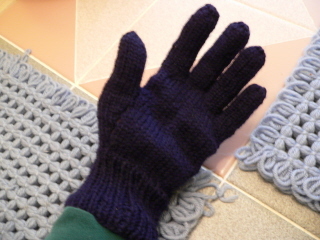 They're made with sock yarn and size one needles. 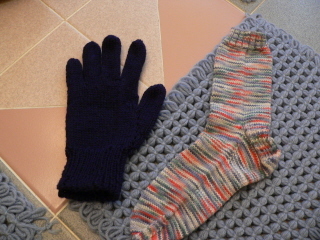 I finished one of my "traveling" socks and one navy blue glove. I really love this sock yarn, though I don't usually go for such bright colors. I bought this yarn from Hello yarn. I can't look at that site without buying something. This is the second pair of socks I'm making from yarn I bought here and I love it. Beautiful stuff. I'm so happy with this pattern book, The Knitter's Handy Book of Patterns. I've had this yarn for years. 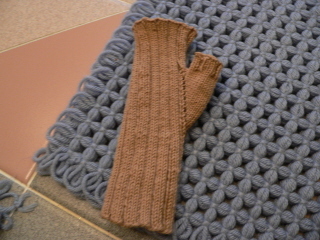 I didn't have enough to make a sweater with it and always thought it would make nice gloves or mittens but didn't have a pattern that worked with this weight yarn. With this book, you make your gauge swatch with the yarn you want to use, using the needles you want to use and then match your gauge with the chart in the pattern. Follow the charts for that gauge and you get a piece that actually fits. I don't think I've ever had gloves fit me this perfectly. The fingers are always just a little bit too long for me. I will be using this book for a long time. I know our lovely Yarn Harlot says that "obsession is normal" but is it normal to want to take out all your sock yarn and just admire it? I have some beautiful yarn waiting for me to make into some warm socks. The danger in looking at it, though, is the desire to start something new. 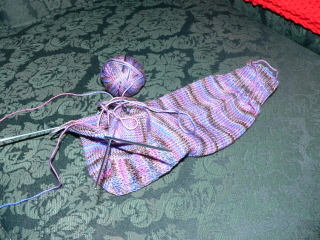 I still have to finish the mate to the sock I just finished and I started another pair with really pretty purple Koigu yarn. Other projects in progress? I have two sweaters started. One is the gold cardigan and the other is a rose color gansey. I'm still working on the purple scarf with the yarn I bought at Knitty City in NYC and a garter stitch cotton bib for Lorelai. I think that's all at the moment. That's really not too bad. Maybe I'll be really dedicated and finish these things before starting anything else. I always seem to get them finished eventually, though. I'll be fine as long as I don't look at the sock yarn. 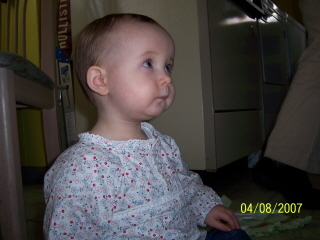 I leave you with a recent picture of the munchkin. Something to brighten a rainy day. 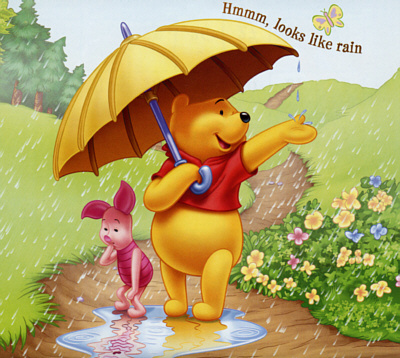 Pooh says stay warm and dry.